My Barbarian Double Agency production still. Photo: Robbie Acklen. Making fun may be our best strategy for survival. Or at least the best way to stay cool in the heat of the in-between, the space of interruption where My Barbarian does their most incisive work. Here the notorious collective—founded in 2000 by Malik Gaines, Jade Gordon, and Alexandro Segade—talks about “Double Agency,” a multipart, multimedia project built on and around the Los Angeles County Museum of Art for the institution’s fiftieth anniversary this month. A Double Agency performance featuring My Barbarian with Robbie Acklen, Nao Bustamante, Jibz Cameron, and Adam Dugas takes place at LACMA on Tuesday, April 28 at 7:30 PM. BACK IN 2013, Rita Gonzales and Christine Y. Kim invited us to make a performance celebrating LACMA’s fiftieth anniversary. We knew that our project, “Double Agency,” would have to be more than a one-time performance and so we also made a four-part web series and twelve masks, a bait-and-switch that sort of defines the work’s logic as a whole. The three of us grew up going to LACMA. The museum has plans to replace much of its campus with a new, singular building, and one thing that interested us, aside from the fact that the buildings we grew up with are coming down, was the ersatz nature of the place. You can read the architecture archaeologically: The buildings’ shapes and materials tell you the history, and this suggested to us a kind of time travel, like watching a bunch of episodes of Doctor Who back to back. It also looks like a movie set, something like the old MGM lot where you had ancient Rome next to a town in the Wild West. Given the resource of this “studio lot” and the way we ourselves inhabit an in-between space in the museum as artists who make experiences as well as objects, we decided to explore the spy-movie genre—a form where things aren’t as they seem and people have multiple, competing allegiances. We began a web series to be shot at LACMA that we would release prior to the performance. After working together for fifteen years, we know that you make a performance and then it’s done and all you have is documentation that may not even be watchable. But TV is always supposed to be watchable. Working with the curators, we researched LACMA’s collection of masks and selected examples from the Mesoamerican, Asian, African, and Ancient Western collection, uncrating and photographing them so that we could make our own LACMA show. Using prop-making techniques from theater and Hollywood, we created exact forgeries of twelve of them. These will be shown at the final performance, which is a song-cycle masquerading as an art opening, a video shoot pretending to be a performance, an exhibition called “Masks of the World”—at which they will be stolen. My Barbarian, Double Agency: Episode One: The Viewer and the Viewed, 2015. We watch a lot of TV, and while there are echoes of experimental films, performances, and videos in this project, the first three seasons of Mission: Impossible (1966–69) were very much on our mind. The Cold War milieu, the duplicitous LA backdrop, the obsession with technology that looks like one thing but does something else, and the political dress-up of the characters who work for a non-governmental spy organization all connected with us because in many ways, as intermedia artists in the twenty-first century, we have that job too. In a way the “Double Agency” project, from webisodes to masks to live performance, is all television. The title becomes both a pseudonym for My Barbarian and a description of how we work among fields of cultural production. As black-box theatricalists who snuck into the white cube, we are double agents, serving our own idiosyncratic interests even as we collaborate with institutions to serve the “public,” a designation rife with contradictions in the museum context, one which we have designs on exceeding. 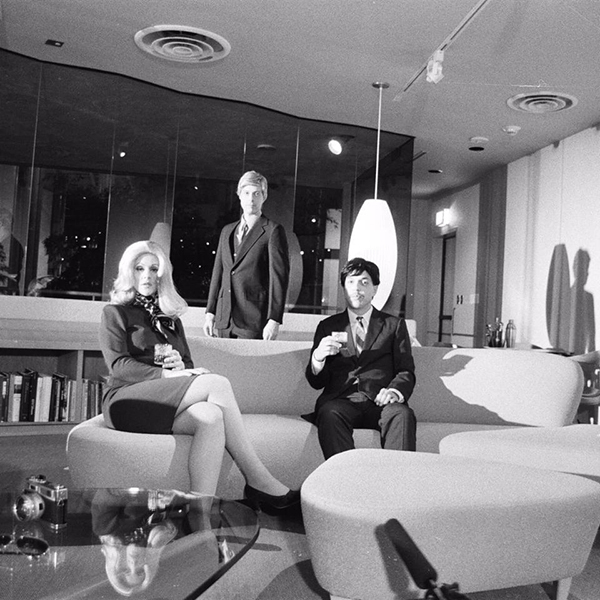 The characters were modeled on those played by Gregg Morris, Barbara Bain, and Peter Graves in the original Mission: Impossible, but since we never “act” in our work, we used these models to adapt our own personae. Malik Gaines becomes Agent Mike Games, who sets out on a mission to infiltrate the elite Non-White Commission on European Beauty and Excellence. Jade Gordon is Agent Jazz Jordan, who accesses the museum offices by pretending to be Franka Petersen, a non-contemporary art curator whose hypnotic exhibition “Masks of the World” is designed to spread a favorable ideology. And Alexandro Segade is Agent Alonzo Degrassi, who assumes the identity of a security guard to expose another impostor in a dangerous mission that will bring him into conflict with the very question of life itself. The three of us joke a lot together; double-entendres and bad puns are often the seeds for works to come. Many of the artists who inspire us—Eleanor Antin, Asco, Jack Smith, Lorraine O’Grady, Ann Magnuson, Vaginal Davis, Andrea Fraser, Coco Fusco—are funny, even as their satires scathe. But we are also interested in making work that has a kind of beauty that comes from loving the flawed constructions people make to represent themselves. We revel in the baroque trappings of genre. We wear wigs for a lot of reasons. So the joke’s on us too.